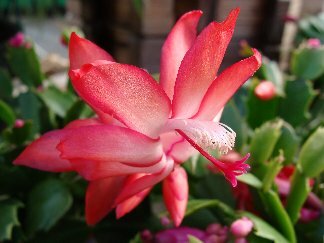 The Christmas cactus’ claim to fame is often the fact that they can and have been passed down generation to generation. It is not unusual at all for someone to have one that belonged to their grandmother or great-grandmother, hence the term “Grandmother Plant.” Although classified as a tropical plant, it is an extremely easy, but beautiful and showy plant with which to begin if you are a novice gardener. With bright pink, red or pale whitish pink blooms, they are a rare treat during a cold, dark winter, which may be why they remain so popular. Although they are called Christmas cactus, in reality, they are in the zygocactus family, and many of them bloom at Thanksgiving. The trick to making them re-bloom is the same as with a poinsettia – natural daylight. From late September on, make certain that the plant is exposed only to natural daylight, receiving no artificial light from indoor lamps in the evenings. Make sure it receives approximately 12-14 hours of darkness each day to encourage the buds to develop and flower. Continue this dark, cool treatment for 6-8 weeks or until blooms appear. Once the blooms have formed, move your cactus to a sunny location. The more light you give it, the more blooms it will produce. Christmas cactus will bloom better if they are pot-bound as well, so don’t be in a big hurry to transplant as the plant gets large. Keeping it dry and cool for this period of time will also help to initiate buds. Keep the temperatures above 50 degrees and the correct amount of water, meaning do not over water. Since it is a tropical plant, you want to mimic the conditions found in the tropics – high humidity. You can help increase the humidity for the plant by placing it in a pan of pebbles and water or keeping a container of water next to it. If you want to start your own legacy with this plant, simply break off a piece to share with your family and friends. Take a short, Y-shaped segment from healthy plant foliage. Place it in potting soil, moisten evenly and place in a well-lit location, but out of direct sunlight. Transplant when the cutting shows signs of growth. Among the most beautiful and vibrant of the winter flowering plants, the Christmas cactus is well worth the effort. I don’t even know what to say. Speechless. this is so true isn’t it?? ?